New Zealand-based dairy company the A2 Milk Company has announced that its application for listing on the Australian Securities Exchange (ASX) has been approved in principle, subject to customary pre-quotation conditions. The conditional approval for ASX listing comes at the same month as the Company exhibited its milk products in the US at the one of the world’s largest ‘natural, organic and healthy’ products expos. 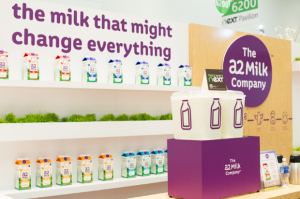 Commenting on the recent debut of the Company’s A2 branded Milk at the National Products Expo in the US, the A2 Milk Company’s US Marketing Director Jim Smith said the reception of the branded milk had been pleasing. “The reception from consumers, retailers and farmers tells us that A2 Milk has a real and significant part to play in restoring confidence in dairy milk among the many Americans who have significantly reduced their consumption in recent years,” Mr Smith said. A2 Milk will commence its US launch, beginning with the Californian region, from April 2015. A2 branded milk in the US will carry a new marketing message: ‘The Milk That Might Change Everything’. The A2 Milk Company said it would retain its New Zealand incorporation following its Listing. The Company will not undertake any capital raising as part of the ASX listing process. The ASX has not yet confirmed the date on which official quotation of The A2 Milk Company shares would commence on the ASX, but the Company said it expects to be informed of the date soon. Australian Food News reported earlier in March 2015 that food manufacturer Freedom Foods, which is currently the largest single shareholder in the A2 Milk Company, had “reclassified” its shares in The A2 Milk Company as “Available for Sale”. This categorisation of the A2 shareholding can now be understood in the context of the ASX float. The A2 Milk marketing message in Australia has emphasised how consumers feel good after consuming A2 Milk. This has been an easier message to convey than marketing the fact that A2 Milk does not contain A1 beta-casein. The scientific basis for A2 Milk milk relies on variance in structure between A1 and A2 proteins that results in these proteins being broken down differently during human digestion, and a belief that the A2 protein is easier to digest than the A1 protein. Milk rivals such as food manufacturer Lion and its Parmalat brand have promoted the fact that Parmalat milk includes A2 protein while also containing the A1 protein. Some commentators have suggested that the Parmalat campaign has had the effect of neutralising or detracting from the implied message that the A2 Milk Company is trying to convey about A2 Milk. In Australia, it should be noted that A2 Milk is not marketed as ‘A1-free’. Australian Food News reported in February 2015 that the A2 Milk Company had recorded a profit after tax for the six months ended 31 December 2014 of $125,000, a drop of 81 per cent on the same period in the previous year. The Company attributed the drop in profits to one-off costs associated with the listing of the Company on the Australian Securities Exchange (ASX). The Company also said its latest data showed the market share of A2 Milk fresh milk in Australia had grown to approximately 9.3 per cent by value in the grocery channel (Australian Grocery Weighted Scan December 2014 quarter).